Dhaka (ANTARA News) – The Embassy of the Republic of Indonesia in Dhaka encourages Indonesian entrepreneurs and investors to expand their businesses and start investing in Bangladesh that is viewed as having huge business potentials. “Over the past few years, economic growth in Bangladesh has been very stable. The challenge is to bring Indonesians to do business here,” Indonesian Ambassador to Bangladesh Rina P. Soemarno stated here, Tuesday. According to Ambassador Soemarno, one of the main challenges in encouraging business and investment from Indonesia to penetrate Bangladesh is the lack of Indonesian knowledge about Bangladesh and vice versa. “The main problem is that many Indonesians do not know Bangladesh well, although Bangladesh`s economic growth reaches around 7.5 percent per year. In fact, the growth of rich people in Bangladesh is the highest in the world, with a 17.8 percent increase over China,” the ambassador stated. According to Ambassador Soemarno, Bangladesh`s stable economy allows entrepreneurs in the country to develop their businesses more rapidly. In fact, the number of people from the upper class population in Bangladesh is forecast to reach 35 million by 2025. To this end, Soemarno has encouraged Indonesian entrepreneurs and investors to capitalize on the rapid growth in Bangladesh`s economy. 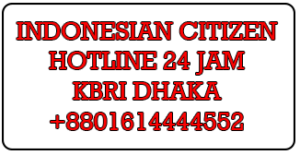 The Indonesian Embassy in Dhaka has also made several efforts to attract Indonesian businessmen and investors to do business in Bangladesh, one of which is through seminars. “We hold a seminar to introduce Bangladesh and to attract Indonesian investors and businesspersons to do business in Bangladesh. At the Ministry of Commerce, we convey about business opportunities in Bangladesh,” Ambassador Soemarno stated. She added that the Bangladesh government has been attempting to create a business climate that eases foreign investors to invest in the country. One of the attractive investment policies in Bangladesh for foreign investors is the government allowing foreign ownership of 100 percent in certain sectors. The Bangladeshi government also provides protection of intellectual property rights. In addition, investments in infrastructure projects, including the electricity sector; oil, gas, and mineral exploration; telecommunications; ports; and highways, are widely opened in Bangladesh. “The challenge of doing business in Bangladesh is certainly not easy, but if Indonesian businessmen and investors do not enter now, that opportunity will be seized by those from India, China, or Malaysia,” Ambassador Soemarno stated.